Marcus Lowther does lunges as part of the Pacers Combine than followed the First Down 5k. Photo by Swim Bike Run Photography. Feb. 2? Outdoors? Not in the deep south? It seemed like a risk, especially as the week progressed, with a fresh coat of snow and plunging temperatures. On the other hand, unpredictable conditions are part of the sport’s charm, challenge and character. If you were looking on insight into the New Jersey-hosted Super Bowl XLVIII, you’re in the wrong place. The inaugural First Down 5k managed to luck out with weather and draw a big crowd, fast times and the kind of race that usually comes around months later. [button-red url=”http://www.albanyrunningexchange.org/results/search.php?ID=3734″ target=”_self” position=”left”] Results [/button-red]The flat out-and-back course starting and ending in West Potomac Park greeted runners with still winds and temperatures in the low 40s, a far cry from Wednesday’s coat of ice and snow in East Potomac Park. The Potomac River, however, remained still, covered in a layer of ice. Those favorable conditions did little to help runners who undertook the day’s second challenge- the Pacers Combine, which presented a four-part physical fitness challenge. Seconds after breaking the tape in 15:12, Bethesda’s Andrew Brodeur turned to his right and got to work on the grass. First up, 20 pushups, most of them admittedly pretty lame. He got a boost when Pacers-New Balance training partner Matt Kroetch, who resembles “Friday Night Lights” quarterback Matt Saracen. After crossing the combine’s finish line, dazed competitors had a chance to make a heads-up play, when race volunteers would toss them a football. Lisa Lazarus, a Washington resident, pulled hers in like Josh Gordon of her native Cleveland Browns. The race was a step in her year of progressive goal setting. In January, she decided she would start training, finish a 5k and with hope, enjoy it. “I’ve never really enjoyed running, but I decided it was something I should be able to do,” she said. She enjoyed it. One of her biggest challenges, as it turned out, was dressing for the race. After bracing for cold weather throughout January, when she ran mostly outside, the temperatures in the low 40s were a pleasant surprise. But she survived, thrived and is now looking forward to the St. Patrick’s Day 8k in March. Lorne McLaughlin, of Brandywine, Md., used the race to jump-start his running for the year, after a New Year’s Day 5k in Calvert County. 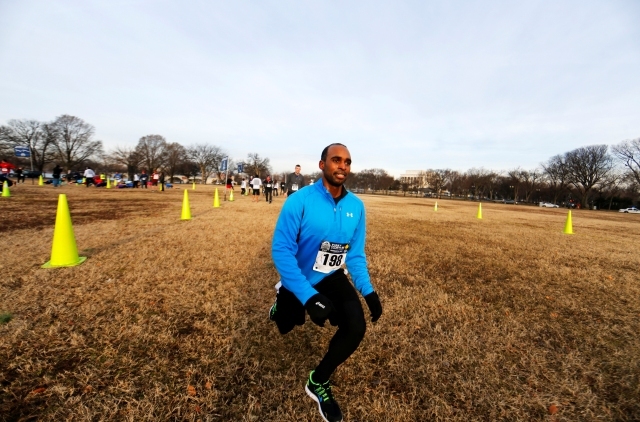 He is working his way up from the 5k-10k range to the half marathon this year, with hopes of the Marine Corps Marathon or Richmond Marathon in 2015. Alexandria’s Meghan Murphy took advantage of the great day to run a seven-minute PR. Getting to the race might have helped booster her adrenaline. She slept in and woke to the sound of a friend banging on her door. Mike Shields of Bethesda dressed the part, wearing a Rod Woodson jersey from his time with the Pittsburgh Steelers. One of the fastest players in NFL history, Woodson won All-America honors in the hurdles and qualified for the Olympic Trials while at Purdue.